When to USE and NOT to USE a Paint Sprayer? How To Buy The Best Paint Sprayer? Finding the best paint sprayer for home use can be overwhelming. There are tons of different models out there that promise impressive paint job results. Yet, only a handful of them lives up to it! It’s the reason why we sought out to test, measure, and compare their efficiency and performance. We ended up identifying what we believe are the top 7 paint sprayers for homeowners and hobbyists. They are versatile, powerful, and easy to use even for beginner DIYers. Quickly learn about their key features and benefits with our paint sprayer reviews below. With this in-depth guide, you should be able to identify your ideal sprayer in no time. A tool that will tackle your painting job with little efforts. 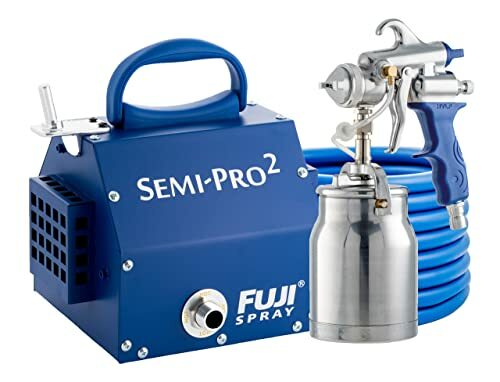 The Fuji 2202 Semi-PRO 2 HVLP Spray System was designed with the hobbyist painter in mind. It’s a combination of versatility and energy saving that comes at an affordable price. The fully-automatic system of Fuji Semi-PRO 2 makes it easy to use even on the hands of amateurs. With it, you will give your paint job an outstanding finish. Regardless of whether you’re a beginner or savvy DIY painter. It has 2-Stage Turbine that can handle thicker paints. 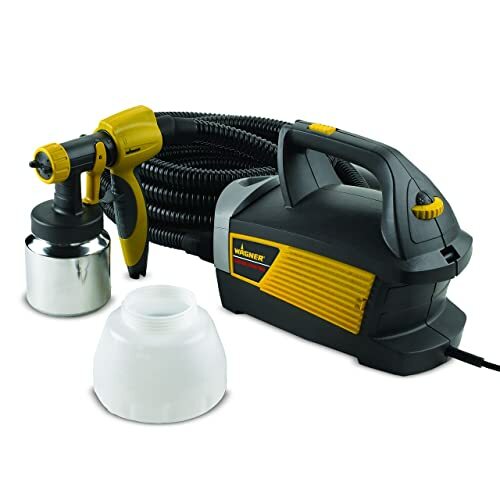 This paint sprayer features a 1400W 2-stage bypass motor. It’s powerful enough to handle dense materials like acrylic and latex. Fuji Semi-PRO 2 is equipped with a 25-ft long hose that is durable and flexible. The durability is enhanced by its protective plastic isolation. While its flexibility allows you to effortlessly reach unusual angles, like corners. Its Pattern Fan Control Knob allows you to easily change the painting patterns. Unlike a rotating nozzle system, that is adapted in most paint sprayers, fan control saves a lot of time. And it’s even more precise! The Fuji 2202 Semi-PRO 2 will help you achieve professional paint job result around your home. With it, you will get excellent performance when painting indoors and outdoors. Including cabinets, doors, ceilings, walls, and fences. The Wagner Control Spray Max stands out for being affordable and easy to use. Making it the ideal paint sprayer for the handyman who is looking to handle small household painting jobs. Easy to set up, operate, and clean! Paints in three different spray patterns. The Variable Flow Trigger is arguably the best feature of this Wagner paint sprayer. With it, you can easily adjust the spray pattern width from 1/2-inch to 12-inches. The pressure ranges from 1.50 to 2.63 psi. A feature that offers you more control in the paint job. The Wagner Control Spray Max is equipped with 2 containers for versatility. The 1-quart professional grade metal cup is ideal for smaller projects that need a fine finish. While the 1.5-quart cup is suitable for larger painting jobs. It also comes with a 20-foot High Flex Air Hose for flexibility. It’s long enough to handle larger painting jobs like garage doors and fences. Yet, its flexible design allows you to paint the tightest of surfaces with a little effort. The Wagner Control Spray Max is an excellent choice if you are looking to occasionally handle small painting jobs. It is one of the best paint sprayers for home use that can effectively primer, stain, varnish, and seal! 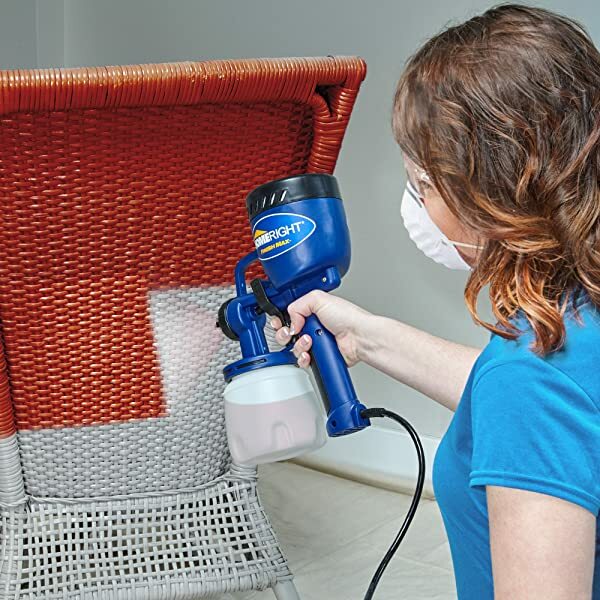 Graco is reputed for designing superior paint sprayers for homeowners and DIYers. 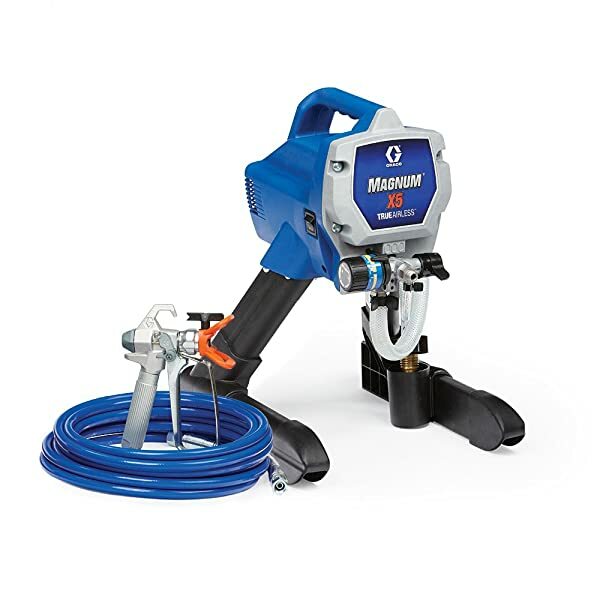 And they don’t disappoint with the Graco Magnum X5 Stand Airless Paint Sprayer. With it, you will effectively tackle large and small painting projects with much ease. Thanks to its control paint flow feature that allows you to adjust the pressure. Graco Magnum X5 stands out for its ability to spray directly from paint bucket. All you need is to fix the flexible suction tube in a 1 or 5-gallon paint bucket. Furthermore, the Stainless Steel Piston Pump allows for its use with unthinned paints. It comes with a Metal SG2 Gun that allows for painless spraying on large areas. Like garages, walls, ceilings, sheds, and fences. What’s more, the gun features a durable full-trigger and is compatible with 0.011, 0.013, and 0.015 tips. The system runs on a 1/2 horsepower motor. That allows it to put out a maximum pressure of 3000 PSI. Making it powerful enough to handle both your interior and exterior painting jobs. The Graco Magnum X5 works best with thin and medium materials like latex and acrylic paints, making it the best home paint sprayer for handymen who want a versatile tool! 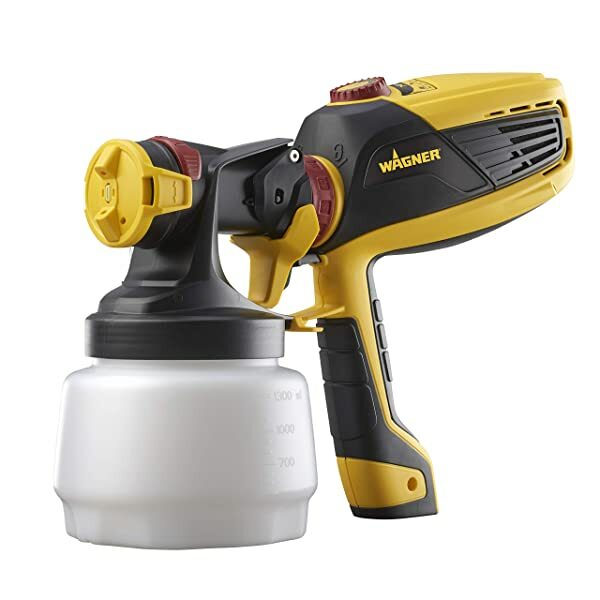 The Wagner FLEXiO 590 Sprayer is hand-held sprayer kit! Designed for power and flexibility when spraying both indoors and outdoors. It’s designed with the patented X-Boost Power Dial technology that has 9-speed settings. A feature that allows you to adjust the level of air pressure produced by the motor. A high air power level offers faster coverage with a smoother finish. While a lower air pressure results in a rougher finish. With its adjustable nozzle, you get versatility at its best! Such that you can easily change the spray patterns and width of the arc by rotating it. Higher air power and wider pattern let you complete a larger project in no time. On top, you also get a material control knob on the cap. With it, you have all the room to determine the amount of paint ejected by the nozzle. By tightening it, you will shut the inner valve and thereby reduce the paint flow. An ideal setup for painting small projects with minimum overspray. The Wagner FLEXiO 590 Sprayer offers a professional painting job finish. And you don’t need to be an expert to use it. No wonder it is the best rated paint sprayer for DIY enthusiasts and professionals! Yet another handheld paint sprayer in our roundup list of the best paint sprayer reviews. The Graco 16Y385 TrueCoat 360 features an innovative FlexLiner paint bag system. It allows the unit to spray a full 360 degrees circle in all directions without glitches and leaks. The tool packs a durable High-Pressure Stainless Steel Piston Pump. With it, you should be able to spray the paint without thinning. It works best for small projects like windows, furniture, garage doors, and interior walls. It features an integrated-scale air pressure knob with 1 to 10 levels, allowing you to easily set the intensity of the air flow. For example, thin paints require less airflow intensity of about 40% whereas viscous materials will need more power. 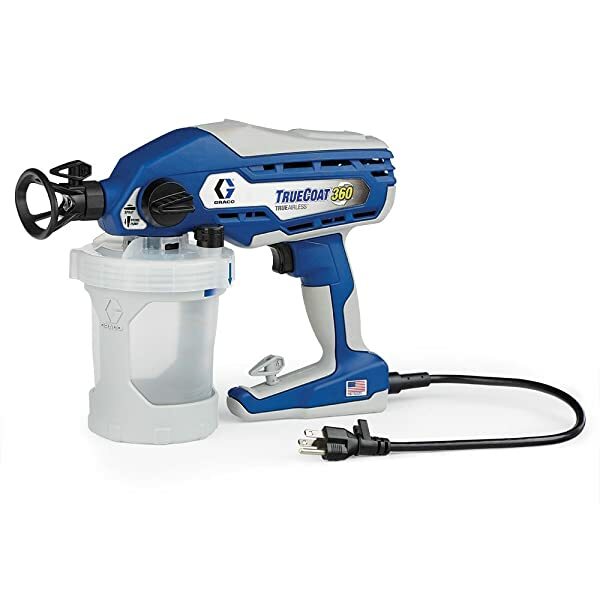 The Graco TrueCoat 360 Paint Sprayer is what you need to handle your home improvement painting projects. With its recommended annual use of up to 25 gallons, you will handle most of your indoors and outdoors painting jobs around the year! Wagner 0529033 Home Decor Sprayer stands out for its ability to spray decorative paints like milk and chalk type. This unit will also handle other materials especially lacquers, sealers, and stains. The Wagner Home Decor spayer features paint-saving controls. They include material flow control and a pattern adjustment dial. Using them is pretty easy. And it’s always advisable to test the patterns on a scrap surface. You can use a narrow spray pattern to achieve the best results when painting spindles and chair legs. Or consider the horizontal and vertical spray patterns when painting dressers and buffets. The unit offers splendid results for small wooden surfaces paint projects like cabinets and furniture. You will end up with a glass-smooth finish, unlike the rough surfaces created by brush marks when hand painting. The Wagner Home Decor Sprayer was designed with versatility and control in mind. Its lightweight design will help you create masterpieces when handling your home decor and craft projects. 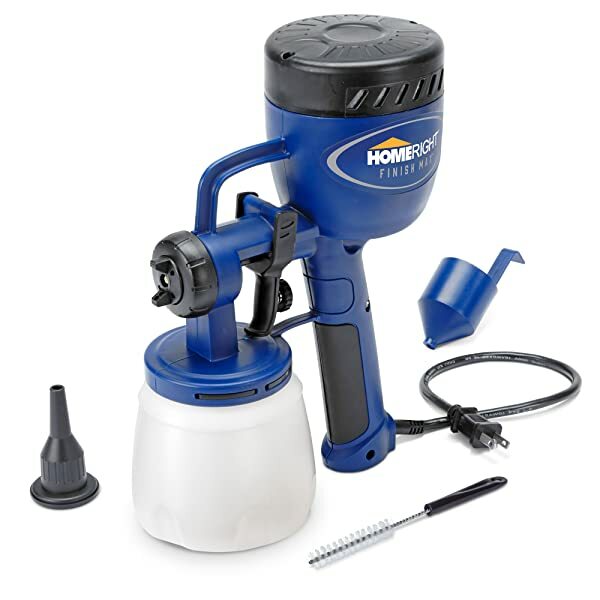 The HomeRight Finish Max Power Painter is a beginner friendly hand-held paint sprayer thanks to its lightweight design and an easy to use and adjustable flow control knob. The paint sprayer is equipped with a 400 watts motor. Something that makes it one of the most powerful HVLP sprayers today! With this in mind, you are assured of precise spray patterns and a superior finish. Adjusting the spray volume, from 1” to 6” wide, has been made easy with the Flow Control Knob. It also features three spray patterns – circular, vertical, and horizontal. You can effortlessly set more output and pressure to get the painting job done quickly. The Finish Max has been equipped with a 2mm brass precision nozzle and tip. That’s unlike most paint sprayers that feature plastic nozzles. With this design, you will end up with high-quality spray patterns. And superior performance. The HomeRight Finish Max paint sprayer lets you handle your DIY home remodeling painting jobs without breaking your bank. It is ideal for small projects like kitchen cabinets, furniture, doors, and crafts. Buying the best paint sprayer will complement your home painting job as a DIYer. It helps in getting the job done faster while giving it a professional finish! Paint sprayers are reputed as the most efficient solution to the tedious brushes and rollers. Painting with a sprayer is as simple as pulling the trigger and let the nozzle fly paint on the surface. With them, you will easily hide the imperfections on rough textured surfaces while achieving a glass smooth finish. Yet, even with such perks, paint sprayers can be a disadvantage when working on certain paint jobs. If you have got a large exterior space to paint. Such painting jobs like fences, exterior walls, and roofs. If you would like to paint inside a large empty room. A sprayer will give the interior of your rooms a quality finish in half the time you would have taken when painting with a roller or brush. When painting furniture. A paint sprayer will get into the hard-to-reach spots while giving it a more even coat. If you would like to get a glass-smooth finish on wooden surfaces. Such as doors and cabinets or the wooden parts of your furniture. When painting hard-to-paint surfaces like ceiling boards and trims. If you’re already living in the house you intend to paint. You risk damaging your existing finishes. Not to mention the tedious process you will undergo in prep time to ensure you contain the spray. When painting small spaces, the sprayer isn’t the most ideal tool. There is no point of taking hours on prep work when you would rather use a roller or brush. If prep work and cleaning isn’t your thing! Remember immediately after the painting job, you will need to take the sprayer apart and give it a thorough cleaning. When you’re budgeting your paint. Since sprayers use more paint than brushes and rollers. Now that you understand when to use and when not to use a sprayer, it’s time to confirm if it will work on the paint task at hand. Or you might consider using a roller or brush. Finish – A paint sprayer will give you a smoother coat compared to a brush or roller. Application Time – A sprayer lets you get the task done in less than half the time. Keep in mind that a brush will need the application of more than one coat. Efficiency – With a sprayer, you will get into the hard-to-reach places. Not to forget its ability to override surface imperfections. Coverage – You cover a large swath when using a sprayer. But you may need to use a roller or brush on patch-work to cover areas where the sprayer did an uneven paint job. Environment – A sprayer isn’t the ideal tool in windy, cold, or hotter environments. Yet, brushes and rollers work in any type of environment. Adhesion – If you’re using a cheap sprayer, you will end up with less adhesion. But the paint will stick on the surface perfectly when using rollers and brushes. Control – With a brush or roller you have more control over both the paint and the paint job. Thankfully, paint sprayers like the HVLP options now offer for more control! Don’t just focus on the initial cost, but also consider the operational and maintenance costs. As a DIYer, you want to go with a model that comes with different nozzles. This allows you to work on different paint jobs while achieving a pro finish. How versatile is the model? Ensure that it can work perfectly both indoors and outdoors. As well as on different surfaces. It should also be durable! How easy can you get the replacement parts and accessories? You want to ensure that they are readily available and affordable. Just as a reminder, pay attention to how easy it is to operate the sprayer. It should work in the way you intend to use it. How do I Control Overspray? The best way is to fully prepare the surface. If you're working indoors cover your furniture with plastic sheets. You should also tape all the areas you don't intend to paint. Always paint with the gun at least 25 cm from the surface. Ensure that it is pointing perpendicularly to the surface. You should also avoid applying too much pressure on the trigger. Another ingenious way is by designing your own spray booth or cardboard shield. They ensure you focus all the spray on the intended surface. Fill a bucket with water if you used a latex-based paint. Or paint thinner if you used an oil-based paint. Next, disassemble the unit and soak the parts. Use an old brush to gently scrub off any paint residue. Reassemble back the unit. Disassemble the sprayer and leave the clogged nozzle submerged in water for a few minutes. While it's still wet, use a cotton bud to remove the clogging paint residue. Blowing it can also work! Can I Use a Paint Sprayer for Primer? Absolutely YES! You should otherwise 'thin' them to get the best results. Can I Use Paint Sprayers Indoors? A resounding YES! But remember to keep the room well ventilated and wear protective gear. Are Paint Sprayers Better Than Brushes and Rollers? Since they are easier to use and offer for faster operation, they become the best equipment for painting large surfaces. They also offer smoother finishes. Which is the Best Paint Sprayer for Furniture? I would recommend the HVLP sprayer. It delivers excellent results when it comes to detailed spraying. You also have more control when operating them. Which is the Best Paint Sprayer for Walls? I would recommend the airless sprayer for large walls. That's if you're intending to paint a house with large rooms. But the HVLP sprayers make the best bargain for home wall painting as they can be used in other smaller projects around your home. Which is the Best Paint Sprayer for Fences? Depending on the size of the fence, any type would work. With airless being the best for larger fences and HVLP sprayer being the most ideal for a DIY fence-painting project. How Do You Extend a Paint Sprayer Lifespan? Simple! Ensure that you're keeping it clean and dry after every use. Making sure that it has no trace of paint in the gun, pump, and pipes will avoid blockages. NOTE: Use water for water-based paints and paint solvent for oil-based paints. Buying the best home paint sprayer shouldn’t be overwhelming. With the above paint sprayer reviews and buying guide, it narrows down to hand picking your ideal tool. And even while you’re at it, it’s always advisable to start by listing down the surfaces you will mostly paint. A superior paint sprayer will save you time when painting large surfaces. Yet, a compact, hand-held tool is best for small projects like paintings and furniture since they are lightweight and easy to control. Remember, we always recommend starting with a test job! 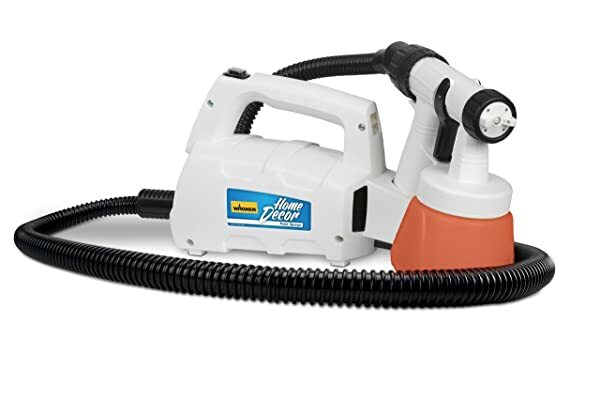 What Types Of Paint Sprayer To Buy?